When I visited Seven Stills, it was not a pretty day. In fact, it was pouring down rain. I had to take the T down to the Bayview/Hunter’s Point area. It’s not an area that I am familiar with, so I was pretty anxious. I was also anxious because I have never toured a distillery before. I mean, I know nothing about distilling, or should I say, I knew nothing about that process. I arrive at their warehouse tasting room and distillery. It is so cool inside. Immediately you notice the whiskey bar and the beer bar. I wondered why they had both, I mean, aren’t they just a whiskey producer? Tim sees me, he’s super busy, so he asks me to take a seat while he finishes up. I don’t sit, I’m curious, so I start taking loads of photos. Tim comes over and we start our tour. Seven Stills is completely different than most distilleries. 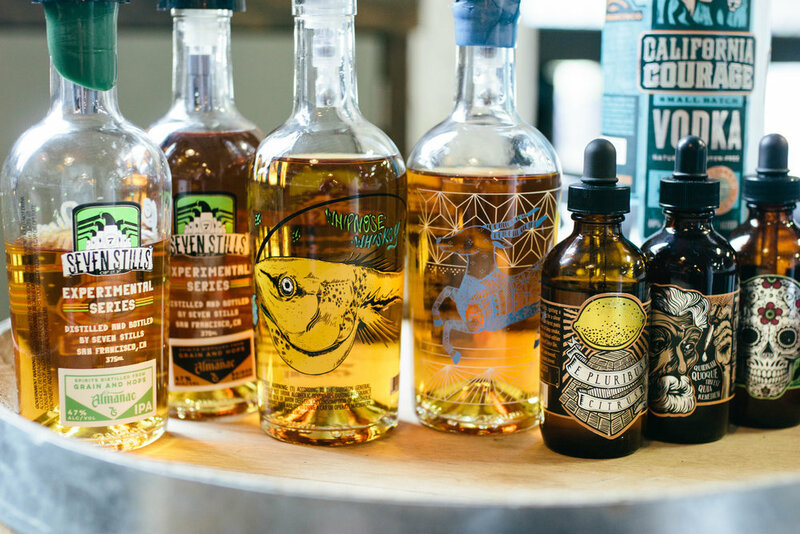 All of their whiskeys are made from craft beer. So basically, they brew beer like regular and then they add a step to it to make it whiskey. The reason that they have a beer bar and a whiskey bar is because their whiskey is made from the same beer. So the idea is, get a beer, and then go get a whiskey that’s made from that beer. Distilling has to start with alcohol, so here at Seven Stills, after the beer is brewed ⅓ gets moved into a bright tank and ⅔ goes into the still. Distillation separates by temperature. Alcohol gets separated from the rest of the liquid because of its boil point being at a different temperature. Super cool, I didn’t know so much science went into making our alcohol. They set the target temp for ethanol so they’re just left with the alcohol. The liquid turns to a vapor and the condensation column has tubes with code water, which turns the condensation back to a liquid. The liquid comes out clear. They redistill slow, low, and really target it, to get the most good alcohol out of it. There are 4 elements that come out of the alcohol. The first is element they discard. Second is heads, they don’t use these for drinking, but they do use these for cleaning. (I think that this makes them quite green.) Next are the hearts, which are what they use for whiskey. And finally are the tails, which are closer to water. These are just floral, not really alcohol. The hearts are 150 proof when straight out of the distillery. They add water back to proof down to cask strength. Vodka is a grain neutral spirit. Whiskey gets more impurities. They have this thing called a rectification column. It kind of looks like a stop light to me. Something happens in each of the bubbles. The liquid will hit target temperature, fall, and go through each stage again to get closer to ethanol. The cool thing about Seven Stills is that they use beer as their starting alcohol and they really want that beer flavor to still be in the whiskey. They’re working on a new beer where they dry hop the whiskey by packing the gin basket with hops. Distilled water needs to get to 119 proof before it goes into barrels. They use small barrels because the liquid has greater exposure to the wood allowing them to only need to sit for 6 months. You have to treat the barrels with water before you can put whiskey in it or it will swell and you’ll lose whiskey. The bigger the barrel the more time you have to leave it in there. The whiskey is still super hot, so they have to add water to it and proof it down to bottle strength. They use Amarillo hops for the dry hop whiskey and Cascade for the Russian imperial stout. I did have the opportunity to taste a few of their whiskeys and bitters, it was a great experience. The first that I tasted was the Whipnose, it’s made from an IPA with double maple sugar. It was hot on the tongue, rye flavor, slightly bitter. They bottle it at 47% alcohol. Next was Experimental Whiskey, which was my favorite. It’s distilled with a Saison by Almanac. It’s not hot at all, very smooth! 94 proof. Midnight Lightning was the next whiskey that I tried. It was distilled with an imperial stout, brown sugar, and molasses. It’s aged in American oak. It definitely has the molasses taste to it. It’s very dessert like. The final whiskey I tasted was Seafarmer. It’s 59% and cask strength. It was a collaboration with fieldwork. It is super hot. I also got to taste a few bitters, my favorite was the Meyer lemon, great for a gin cocktail I think. The bottles are super unique, they use San Francisco street artists to do them, which I think is amazing. They released 3 whiskeys the first year that they were open and 11 last year. They opened their doors to this distillery on 06-01-2016, soon after getting a taproom in the Sunset in November. They’ll be 4 years old in August. Tim is the owner and the man who showed me around, I got to experience him reacting with customers. You would think that the owner of a distillery to be hard, but it’s quite the opposite. He was joking around, laughing, and really getting to know the people who came into his shop. I don’t think that you find that many places anymore. If not for the beer and whiskey, come in to see Tim. I used one of the Experimental Whiskeys to make a New Fashioned the other day and I have definitely used their bitters almost daily in my gin. This company is good to their employees, their customers, and even the dog that lives there. If you are in San Francisco, schedule a tour. If you are too far away, join the Founder’s club, which gets you 2 bottles of exclusive whiskey 3 times a year.